Squeeze are an English band that came to prominence in the United Kingdom during the New Wave period of the late 1970s, and continued recording successfully in the 1980s and 1990s. The group formed in Deptford, London in 1974, and first broke up in 1982. 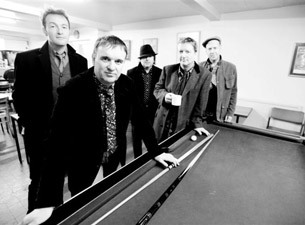 Squeeze then reformed in 1985, and broke up again in 1999. The band reunited for tours through the United States and United Kingdom in 2007, and this touring version of Squeeze has continued into 2010. Squeeze is best known for hits like "Tempted", "Labelled With Love", "Black Coffee In Bed", "Pulling Mussels (From the Shell)", "Hourglass", "Up The Junction" and "Cool For Cats".